Kurt Busch, driver of the No. 41 Monster Energy/Haas Automation Ford, was fastest in Foodland/Food Giant Qualifying, grabbing the pole for Sunday’s 1000Bulbs.com 500. 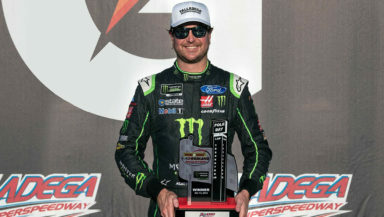 TALLADEGA, Ala. – Kurt Busch led a Stewart-Haas Racing (SHR) onslaught Saturday in Foodland/Food Giant Qualifying at Talladega Superspeedway, taking the pole for Sunday’s 1000Bulbs.com 500. The top four positions – meaning, the first two rows – will be filled by SHR drivers, in the pivotal NASCAR Playoff race for the Monster Energy NASCAR Cup Series. The 1000Bulbs.com 500 is set for a 1 p.m. CDT start on Sunday. (TV: NBC; Radio: MRN, Sirius XM NASCAR Radio). A total of 41 drivers qualified for the available 40 spots. Qualifying consisted of two rounds of single-car runs on the 2.66-mile tri-oval, with the fastest 12 from the first round advancing to the final round. Busch led both rounds in the No. 41 Monster Energy/Haas Automation Ford, with a top speed of 195.804 mph in the second round. His teammates Clint Bowyer, Kevin Harvick and Aric Almirola followed, with Chase Elliott qualifying fifth. The benefit of starting up front at Talladega is debatable. Only four past 1000Bulbs.com 500 pole winners have gone on to win the race: Dave Marcis in 1976, Bill Elliott in ’87, Dale Earnhardt in ’90 and Sterling Marlin in ’95. That statistic underscores the track’s renowned unpredictability – and its “wild card” reputation. Nothing is assured on these high banks. But Busch will take it. Saturday marked the first pole of his career at the two fastest tracks on the NASCAR schedule – Talladega Superspeedway and Daytona International Speedway. Busch has one Monster Energy Series victory at those tracks, in the 2017 DAYTONA 500. Twelve Monster Energy Series drivers remain in championship contention, a group that includes all of the top-five qualifiers from Saturday. For those 12, a victory Sunday will result in automatic advancement to the next round, although Elliott has already advanced via a victory last week. Following next week’s (Oct. 21) event at Kansas Speedway, the contenders list will be trimmed to eight, after which three more races will produce a “Championship 4” showdown going into the season finale at Homestead-Miami Speedway. Prior to qualifying, Timothy Peters (No. 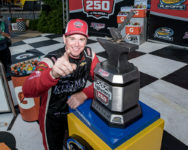 25 Kingman Chevrolet Chevrolet) won the NASCAR Camping World Truck Series’ Fr8Auctions 250, becoming the only driver to win three truck races at NASCAR’s biggest track. Series rookie Myatt Snider (No. 13 RideTV Ford) finished second with polesitter David Gilliland (No. 51 Pedigree Toyota) third. The trucks are notorious at Talladega for the “Big One” – terminology for multi-vehicle mash-ups – and Saturday’s race showed why. A 10-truck accident on Lap 60 took out a number of frontrunners and necessitated a red flag of 11 minutes, 42 seconds. The Fr8Auctions 250 wrapped up the first NASCAR Playoff round for the NASCAR Camping World Truck Series – and it reduced the field of championship contenders to six: Justin Haley, Fairhope, AL native Grant Enfinger, Noah Gragson, Brett Moffitt and former series champions Matt Crafton and Johnny Sauter. After three more events, the truck series will have its own Championship 4 finalized up for the season’s last race at Homestead-Miami Speedway. Ticket information for the 1000Bulbs.com 500 and all Talladega Superspeedway events is available on-line at www.talladegasuperspeedway.com or by calling (855) 518-RACE (7223).